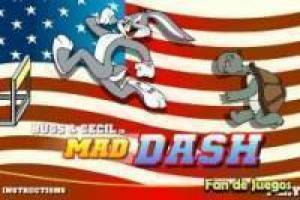 Bugs Bunny is the most famous rabbit from the Looney Tunes factory and now he arrives in a fun racing game in which he will face off against a turtle. These races will not be smooth, but there will be fences and other obstacles that they will have to avoid to reach the finish line. As it is not fair that a rabbit faces a turtle, we will have to jump obstacles while the turtle will go down a clean street of fences. In addition, to win with Bugs, not only do we have to get to the finish line first but we also have to reach the goal of avoided obstacles. 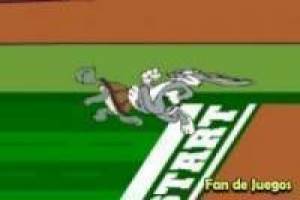 Achieve all this and get to win the turtle in these Olympic races of Bugs Bunny against the turtle. 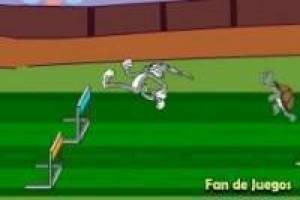 Enjoy the game Bugs Bunny against turtle, it's free, it's one of our Olympics games we've selected.